"With ground beef burgers being one of the most popular meats in the summer months, having the Health Check symbol in place now helps consumers understand that lean and extra lean ground beef can be part of a healthy diet." Now for the sake of today, let's pretend that we don't know that beef consumption increases our risk of cancer and therefore let's ignore the argument that regardless of "lean-ness", beef is a food we should limit. Today I'd like to talk about fat. Now I'm not personally, terrifically scared of saturated fat. Trans I avoid and unsaturated I maximize but saturated, the stuff of beef, I simply try to minimize. Health Canada on the other hand, really doesn't like fat and it puts a blanket limitation on its consumption at 30% of your total daily calories and since the Heart and Stroke Foundation reports that it models its Health Check program off of Health Canada's recommendations, therefore they too recommend that you limit fat to 30% of your total daily calories. The Heart and Stroke Foundation adds additional caveats to fat consumption in the directives we saw yesterday, "
"Look for a lower (10% or less) % Daily Value for fat, saturated and trans fat, cholesterol and sodium." "Get less of these nutrients: Look for a lower % Daily Value (10% or less) for nutrients such as fat, saturated and trans fat and sodium"
So that seems pretty clear. Health Canada says that we should get less than 30% of total daily calories from fat and the Heart and Stroke adds that we should avoid foods containing more than 10% of our total daily fat value. Now back to lean beef (and sorry, some math too). Following the Food Guide and eating Health Check'ed lean beef women can have 150 grams a day and men, 225 grams a day. Lean beef by definition is 17% fat (extra lean is 10%). 17% of women's 150 grams = 25.5 grams of fat. 17% of men's 225 grams = 38.25 grams of fat. There are 9 calories per gram of fat. 25.5 grams of fat = 229.5 calories. 38.25 grams of fat = 344.25 calories. Health Canada, as evidenced by our food labels, believes the average adult needs 2,000 calories daily (though that's likely too much for the average woman and too little for the average man). If only 30% of our daily calories are supposed to come from fat, 30% of 2,000 calories would mean that Health Canada recommends that we get no more than 600 calories from fat daily. 344.25 calories divided by the recommended 600 total daily fat calories = 57% of recommended daily intake of fat. So in case you didn't follow all of that the end result is that if you choose the Health Check'ed lean ground beef that Heart and Stroke Dietitian Carol Dombrow says can be part of your healthy diet and you actually restrict your portion to those recommended by the Food Guide (and let me tell you, that's not a ton of meat), then in that single serving if you're a woman you'll be consuming 38% of your total daily recommended intake of fat and if you're a man 57%, this despite the fact that the Heart and Stroke Foundation also recommends that you avoid choosing any item containing more than 10% of your total dietary fat daily value. So I've got a few questions here. Firstly the obvious one, can I have some of what the folks over at the Heart and Stroke Foundation's Health Check are smoking because their world certainly seems much kinder and gentler than mine. Secondly though, and this one's glaring. Even putting aside all of these astronomical numbers, can you explain to me why the Heart and Stroke Foundation has agreed to lend its good name to lean ground beef when extra-lean ground beef, with 41% less fat than lean ground beef, is readily available? 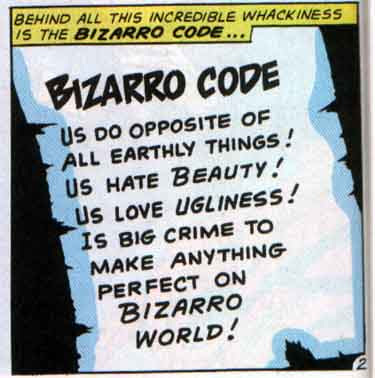 It make me wonder if that Marvel Comics bizarro code, "Us do opposite of all earthly things" is posted outside the Health Check offices. What can YOU do about Health Check? Have you Clicked? Voting Ends Soon! Heart and Stroke Thinks Cookies are Grains! Is This New Product Healthy? I have something nice to say about Starbucks! So you say you want a resolution?